Developed early in the 12th Century, the Great Helm became the mainstay of the medieval fighting man, and lasted for about 300 years. 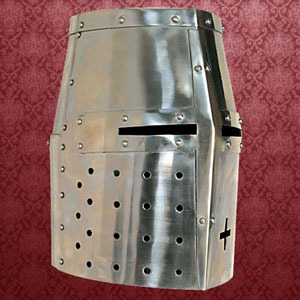 Worn over a mail coif and padding, this helmet has menacing, narrow eye slits for maximum protection. Made from 18 gauge steel.